I was stumbled on the Google AdSense notification "We're working on setting you up, this usually take less than a day but in some cases it could take a little bit longer. We'll notify you when everything is ready. Then start earning money by placing ads". What does it means? How long is the setting up process will take? Will our Google AdSense application be approved some day? Many people want to be publisher of Google AdSense. There are several steps in Google AdSense application. Some people can follow the step easily without any obstacles. Some other don't. I was one of people who had many obstacles during the process of Google AdSense application. In this article i would like to share my experience handling the issue above. One of the road block to be Google AdSense Publisher. Anyway, you can avoid the road block if you're blog has three basic quality of Blog that eligible for Google AdSense application. After the notification, I checked my Google email regularly to see if there was any news from Google AdSense. I thought it will took less than a day to process the AdSense application because they said so. I checked my mail every hours, every time i open my Android phone. After some time, I realized that it could be more than one day to set up the Google AdSense account. After one week, i checked my email and found nothing. In this phase i became anxious and thinking what could be wrong with my blog. The waiting process without notification is very irritating. It feels that nothing i can do to speed up the process or to know whether my account will be approved in weeks, months, years or even never will. In this phase i become frustrating and thinking about creating another Google Account, transfer my blog and re-apply the same blog to different Google Adsense Account. I'm also thinking about transferring my other blog to other Google Account so i can apply for Google AdSense program with different blog. In this case i have tried the second idea. I created another Google account, i transferred my other Blog to the new Google account and apply the Google AdSense program. I thought that the process will be faster since i have corrected any deviation that has potential issue on Google AdSense Application in the new blog. In fact, after sometime i got the same notification that my account is setting up for my second blog. "We're working on setting you up, this usually take less than a day but in some cases it could take a little bit longer. We'll notify you when everything is ready. Then start earning money by placing ads." It seems like another loop from my previous Google AdSense application. I haven't give up yet. I try to find information about this case in Internet and how to solve this problem. I found the articles in Google AdSense product forum. It put my mind at ease knowing that i'm not the only one facing this problem. There are a lot of people who have the similar problem with me. 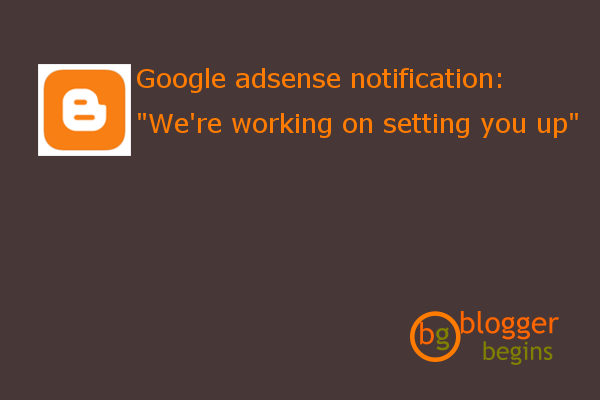 The notification on Google AdSense make us have high expectation on the process. They said usually take less than one day or a little bit longer. That's why most of people become impatient. They expect the process will be fast since the notification said so. Apply for Google AdSense is very easy, however the approval might take some iteration effort back and forward just like my experience. We can avoid this iteration if we read Google AdSense policy and learned type of rejection message from Google. What is the answer of this problem? The expert said that typically it will take at least two or three weeks for an application to complete processing and have a decision rendered by AdSense. He also said that there are 3 things that can cause delay in processing Google AdSense application. Improper implementation of the Code. New site with no organic search traffic. Those answer actually doesn't satisfy me since my blog is already more than 2 years with 500 page views every days. I almost giving up and try another monetizing strategy. Until an email come from Google AdSense team notified me that my Google Account AdSense has been full approved. It took 40 days from the latest notification saying that my account was rejected. These are the complete story. I have another blog that i used to apply Google Adsense (Blog A) in the same Google account as Blog B. I made this Blog A in 2009, contain several articles, it has organic traffic but unfortunately it was not well designed. My Google AdSense Aplication using blog A was rejected due to several issue like the content and the policy. I still writing on Blog B and manage blog B properly. It has more than 50 articles and 500 page views every day. I want to change the blog that i used for Google AdSense application with Blog B. Unfortunately we can not change the blog, it is Google Policy. I suspect there is one articles that against Google Policy. I've got the notification said "We're working on setting you up"
Following Google AdSense policy is very important. I've checked on blog there is article about how to download video from Youtube. This article is against Google Policy. I tried to remove this article and resubmit the application. After several days, I got an email told me that my application has been fully approved. Learning from my experience, if you got notification "We're working on setting you up" please be patient and wait for the notification while checking and improving the blog. Check the Google Adsense Code configuration in Global Tag, Check the Google AdSense code and keep writing the good content. As long as our blog follow Google AdSense policy and it has organic traffic, so it will be matter of time our Account will be approved. Another learning from my experience, don't be so hurry applying for Google AdSense if our blog is still not ready. There are 3 qualities that we need before applying Google AdSense. The first is a lot quality post. The second quality is the blog drive by organic traffic and the third quality is the blog should obey the Google AdSense Policy. As long as we can maintain those three quality, we will okay. The last tips is to ask other people opinion about your blog before apply for Google AdSense. So if you just a click a way from submitting Google AdSense application, please learn from my experience first. It is better to fix the issue before application rather than waiting this long review from Google AdSense and found that there are many gap in our blog to Google AdSense policy. Please read other article about 10 things to consider before Apply for Google AdSense. I'm gladly to help you if you have the same problem as i did. Feel free to ask on comment or reach me through my email. Thank you for reading, please share if you found that these information is valuable for others. 68 Responses to "Google Adsense said We're working on setting you up"
I currently applied for AdSense and I also got the same message. But thanks for the tips. @JYRI.. My account has been approved last month. Just be pattient. Improve your blog and follow lattest Google AdSense email notification. I too applied for Adsense and got the same message. please sir, check my blog and see if its ok.
Hi Elijah,please check whether your blog drive organic trafic or not. As long as you can get organic trafic from your content your blog will have a chance. I'm still waiting for the approval too..
Hallo Pak, i saw your blog has some Google Ad. Please check your email for GA notification. Thank you for your checking. I really aprreciate it. Anyway, right after I wrote the comment here, I worked hard to eliminate all ads I put earlier in my post manually from idfly and another ads. Then, not more than a day after I kicked all the ads, eventually google approved my approval. Now, I know why google had rejected my application for 3-4 times.. Thanks.. Nice discussion. Congratulation.. Thanks for sharing. I hope it can help other blogger that has the same issue. Thanks for your reply.I am not getting what i have missed .This is my first site .Please help me to resolve this issue. Can you please send me mail on admin@au2mata.com what needs to be done .I am new to this.This is my first website.Please help me. Hi Nandini, plese check your email. I wrote some suggestion. Woww a blog about flirting? Never thought about it. Do you check the traffic that you have hot daily from your blog? AdSense is all about ad program. They need the traffic. Hi Suraj, i can not open your link. The blog is not available. Hi bro . Almost a same issue like you. But not sure how to address it . Let me appraise you .. i started a blog . There was only two article and I applied for adsense. It was rejected due to less content. Then I thought to devout some time. I changed the url of the bLog. But while e applying its pointing tk the previous url like yours .still i proceeded and made application once again . And google adsense is showing we setting up your account . My question is this . If the account gets approved will it be for the old or new url. If this url can't be changed, do you advise me to move all the blog content to a new userid at this appointment when there is less number of articles .. Please help . Eagerly waiting for your reply . Hi Manza, thank you for your sharing. I've visited your blog. It still has 8 content. Based on my experience we can not change the URL for Google AdSense application. I try to dig many resources from Internet but found none. Apply for Google AdSense (GA) is tempting. People tends to be hurry in submitting their blog to GA but forgot the very basic thing. GA is an advertisement program. In common sense, for and advertisement program to be worked, it needs audience or visitor. I summarize 3 basic quality of a blog that qualified to be partner of Google AdSense. GA has minimum requirement for those three quality before approving a GA application. Please consider this before resubmitting for Google AdSense. Don't be hurry, keep writing Good, Unique quality post. In the end of the day we need as much as possible the quality post to increase our income from GA program. 2. Create unique long articles that can drive traffic to your blog. Hi Alfian, I've visited your blog. It looks good. It has everything that you need for adsense application. How long have you waited for the AdSense review? I have apply too and stuck in similar situation. Hi Hasan, I've visited your blog and check the alexa rank. It quite big (almost 16 M). Does your web drive organic traffic from Google search? Hi John,it was the expert says in Google Forum. I did not satisfy with his answer also since i don't find any code during the review period. in my case i have adsense account and i cancel it and then i click on reactivate and my account show "we are working on it" message from last 4 months. i try to apply with new email but adsense team reply that you have already approved account but i can't access it . i can't get adsense for my other website also adsense team reply that you already have approved account. i want to fix it with any way cancel it or delete it. please help me to fix. i read your post. you said 1st delay case is Improper implementation of the Code. i don't have ads code. so i can post it in my website. please help me. Hello sir, I am facing same problem. I applied many times but every time I rejected. But yesterday I found that news we're working on setting you up in my blog, associated adsense account abchelpline.blogspot.com. Now what should I do? Hello sir. Your article is very helpful and encouraging. I am also facing the same problem. I see the message " we are working on setting you up " since about 8-10 days for my blog www.chitrannaa.blogspot.in . Will you please visit my blog and let me know what is the problem and how should I address it. Thanks and Regards. A lil private question. how much do you earn with 500 views per day on your blog?? same error on my page but actucaly show full details of adsense when i open my adsense account but front page show "we are working setting you up " what to do ?? Hello! I loved your article, but am still a little nervous... could you check my blog? Any help would be great! I got the same message "We're working on setting you up." Does this mean that I've been approved and just need to wait it out or is there a possibility of rejection? PLease check this out. Thanks in advance. Your contact information associated with Google AdSense was changed on Sep 6, 2018. • Sign in to your AdSense account. • Click the gear icon in the upper right corner of any tab, then, from the drop-down list, select "Payments". i haven't email from google adsense. but sing in google adsense showing under massage. "we are working your setting up"
This usually takes less than a day, but in some cases it can take a bit longer. We'll notify you when everything's ready. Then start earning money by placing ads. plz check out my blog and suggest me it has daily 500-600 previews. Hello sir, I am facing same problem. I applied many times but every time I rejected. after 2 days I found that news we're working on setting you up in my website, associated adsense account UCtrending.com . Now what should I do? blog saya adalah https://ciaaattt.blogspot.com/. apakah blog saya ini cukup ya? I have the same notification" Were working in setting you up". I just started blogging this Dec 13, 2018 with blogger then i posted about 5 articles then after one week i noticed that the google adsense is clikable out of curiosity i submitted an application then now i am waiting for their reply. Bro i am facing the same issue with my blog from last 20 days. i am totally stuck and cant able to figure out what to do. Can you tell me what is the actual matter behind this issue. My blog also is in same status for past 1 week. "We're working on setting you up"